The Craft Room is located on the second floor; enter from the lobby. This area is open to spouses or companions of registered attendees. The craft room is a place for you to relax, work on crafts, read or just enjoy the Arizona sunshine on the outdoor patio. Craft Classes will also be held in the Craft Room area. Craft Classes are available to spouses or companions of registered attendees. Class well be held on Saturday and Sunday, and are available on a first come first serve basis. During the symposium check with the Craft Room volunteer for available spots. 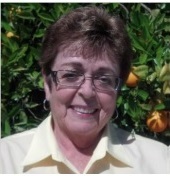 Leslie lives in SCG (Sun City Grand) in Surprise, AZ with her husband, Norris who is a woodturner. Her late mother introduced her to crafting starting at age 8 with sewing, then knitting and crocheting. She started stained glass in college while studying Nursing then moved on to needlework and quilting. After retirement she learned to fuse and slump glass. Following a short period of learning the art of woodturning with Norris in the early 1990’s, Leslie quit to pursue her other interests, and became an inactive partner in Norris’ woodturning, as a constructive critic and idea person. They have made several pieces in collaboration using beads and glass. 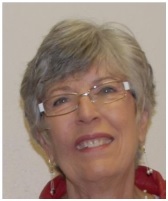 After moving to SCG in 2007 Leslie got involved in the Beading section of the Sun City Grand Stitcher's Club, serving as director for 2 years and teaching frequently. Beading has become Leslie’s passion and needle arts and stained glass have taken a back seat. She specializes in Bead Embroidery, often using her fused dichroic glass cabochons. The Ready’s have both been on the Desert Woodturning Roundup Committee since its beginning in 2006 and handle the registration for the symposium. 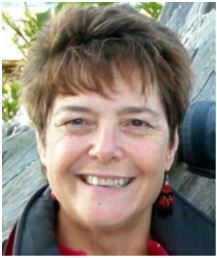 Mary Lou is a Senior Supervisor with Stampin' Up! She has been creating and teaching how to make unique cards for 7-plus years. The class will teach several techniques, layout designs, and many ways to use color to create greeting cards. You will learn how to continue to create cards wherever you are. 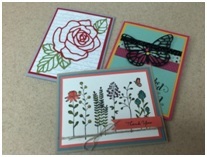 During the class you will create three one-of-a-kind greeting cards to take with you. No experience necessary. All supplies provided. Carol lives in Placitas, New Mexico, with her woodturning husband John. She has been machine knitting for more than 20 years. Since moving to New Mexico, she has become very involved in the fiber art community and serves on the board of directors for the Albuquerque Fiber Arts Council as the Director of Education. Carol began machine knitting because she loved yarns but she couldn’t sit still long enough to complete anything by hand. Once discovered, her passion grew and she now owns five different types of machines. Fee: $10. Fee: $0. Fee: $6. Payment is due at the time of the class. To download your copy of the Crafts Classes and Schedules, click here.